EXPLORE THE ISLANDS THAT FACE THE CITY OF LIMA AND LEARN ABOUT THEIR HISTORY. 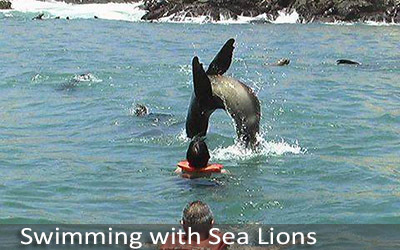 TAKE A UNIQUE CHANCE TO DIVE IN THE WATER AND SWIM WITH CURIOUS AND FRIENDLY SEA LIONS. In the morning, your driver and tour guide will meet you at your hotel and take you to Callao Harbor. At the harbor you will board a boat and head for the Palomino Islands, a great opportunity to observe some seabirds, such as Pelicans, the Inca Tern, Peruvian Booby, Red-legged Cormorant, Quanay Cormorant and occasionally the Humboldt Penguin. Upon arrival at the Palomino Islands, we will provide you with your wetsuit and lifejacket (included,) and you will have the opportunity to swim in the Pacific Ocean with the sea lions! This is a truly special experience and perfect for families. After your swim, we will take you back to your hotel where you will have the rest of the day to spend at your leisure.